Will you shed your blood? It has been a bloody week. Blood has been in our readings every day this week. Some of that is because we’ve been reading the bloody book of Hebrews, but we’ve also heard some bloody episodes recounted in the Gospels: I’m thinking of John the Baptist’s decapitation today and the hemorrhaging woman’s healing a few days ago. And then, earlier this week, Pope Francis said he will canonize Oscar Romero, who was shot and bled to death while saying Mass. And let’s not forget about the already-saints we’ve celebrated this week. We’ve heard about Blaise’s ability to cure a bloody throat and about the heroic endurance possessed by the young girl St. Agatha during the bloody torture she faced. And then there is the bloody story of Paul Miki and his friends, whom we commemorate today. Paul Miki was a seminarian when he died, so today is a special day for us. He was in his 12th year of Jesuit formation (guess 6 isn’t so bad), on the cusp of his diaconate ordination. No doubt that, in the back of his mind, he was thinking about his first homily. He was ready to give his life away. 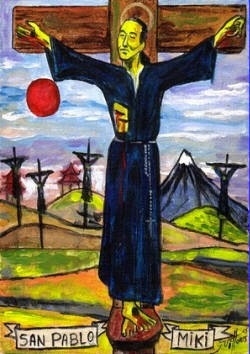 I think St. Paul Miki—and all the blood of this week—reminds us that discipleship means shedding blood, that it is not simply a spiritual affair. Often discipleship gets messy, it gets costly, even to the point of shedding blood, just as Jesus did—for the life of the world. Christianity is very much a blood religion, much as we try to sanitize it. We who receive the blood of our Christ at this altar into our veins are called to shed that very Precious blood, mixed with our own, for the life of the world. We Christians shed our blood more than we realize. I think of blood drives, like the one we have next Tuesday. Sign up. I think of the wounds of veterans. I think of women who give birth and all who shed blood, sweat and tears caring for their families: they often have the calloused and scabbed hands to prove it. And what about us as future priests? We will shed our blood in the paper cuts we get while stuffing bulletins, when the knife slips when we’re preparing some parish meal, and when the cat lady’s cat Mr. Waggles bites us during a home visit. We’ll shed it when moving a file cabinet or fixing a busted boiler, a damaged dishwasher, or problematic pipes. We will get bloody cleaning up after a fight on the school playground and when blood somehow splashes upon us while we are attending a sad soul in broken body in a hospital room. We will shed our blood when our hearts break for our people. And when we get bloody—let us take consolation in knowing that, just as one drop of Christ’s Precious Blood is enough to fill our dreams to overflowing and even bring us to everlasting life, just the same way, one drop of our blood might also be the price of a soul when God is involved. Let us pray with Paul Miki: May the blood we shed fall on the world as a fruitful rain.